My skincare stash up until recently was spilling out of a large drawer under my bed. It had become home to the skincare products that I’d tried and tested that hadn’t quite met the criteria to take place on my skincare shelf. But I’d store them in there ‘just in case’. But I've had a clear out and up until now, no new purchases had been made. But the New Year and cold weather have given me the ideal opportunity (or excuse...) to add a new crop of products to help freshen up my skincare routine. 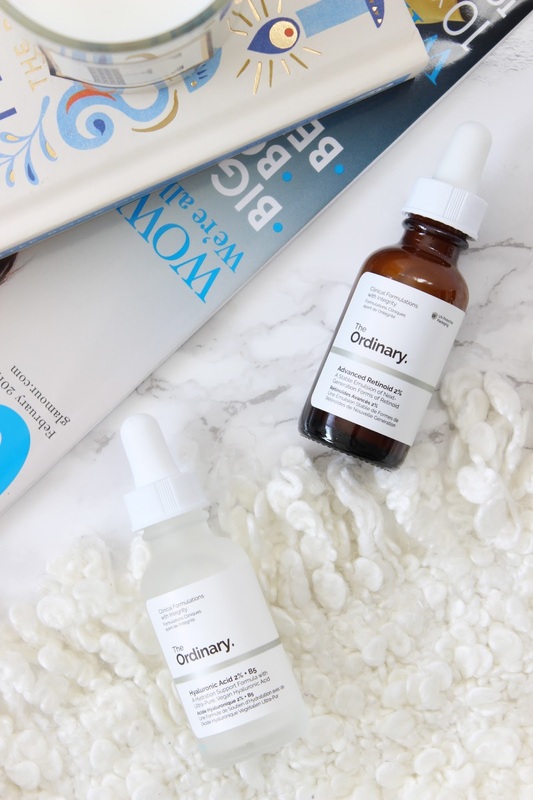 Let me introduce you to The Ordinary: one of nine skincare product ranges from Deciem (which includes NIOD, Hylamide and The Chemistry Brand). The Ordinary is kinda like a no BS skincare range (no marketing frills, unnecessary scents and luxurious packaging) that consists of 24 oils and serums. The formulations are simple with each product containing just 1-2 active ingredients, such as vitamin C, retinol, hyaluronic acid and zinc, but cost a mere £3.90 - £14.90. Which is madness, as I’ve spent over £35 on facial oil before and I've been very tempted to part with £85 for a bottle of Sunday Riley Luna Oil. I purchased The Ordinary Hyaluronic Acid 2% + B5 (£5.90) and The Ordinary Advanced Retinoid 2% (£8.00) in the hope they would address my skin concerns, which were dehydration and dullness at the time. And as I’ve been using these products consistently for the past two weeks, I thought I’d share my initial thoughts. PM, The Ordinary Advanced Retinoid 2% has given my skincare regime the anti-ageing upgrade it required. Retinoid is a skincare ingredient known for improving fine lines, acne, skin texture and tone and helps improve pore quality, so they're less prominent and clogged. Retinoid is usually associated with irritation, flakiness and redness, but I find The Ordinary Advanced Retinoid 2% doesn't aggravate my sensitive skin instantaneously, unlike La Roche-Posay Redermic [R] Anti-Ageing Concentrate. And unlike The Ordinary Hyaluronic Acid 2% + B5 it has a slicker, lighter and tack-free consistency which I much prefer. Once pressed into the skin my complexion glows and is smooth to the touch. With continued use, I've noticed it's quickly helping tackle textural issues. But whilst it's a hard working product, be warned, apply too much too frequently your skin will have a mass freak out, resulting in blemishes and dry patches (as overuse strips away the skin's protective layer of natural oils). I learnt the hard way, so be patient! Will you be adding a few of these power-packed goodies to your beauty regime?